Are you looking to become a state licensed Florida Building Contractor? Gold Coast Schools of Construction is Florida’s leader in contractor education for the building industry and will provide you with the knowledge and confidence needed to get your license. Our materials are continuously updated to reflect exam and code changes, and are direct, yet simple to understand. Our instructors are licensed practicing professionals including Contractors, Architects, Engineers, Building Inspectors, and OSHA trainers who care about your success. Below you will find complete details about our Building Contractor licensing course. If you have any questions, please contact our helpful Career Counselors at 1-800-732-9140. We are happy to assist! Please select your prefered class, location, type of class, and start date from the menu below. Choose from either classroom or online options. The Gold Coast School of Construction is the leader in construction education for both Registered County and State Certified contractors in the state of Florida. Students enroll with Gold Coast because they have one goal, to pass the state exam and become a licensed Building Contractor! Our curriculum, methods, and team of experienced instructors are dedicated to helping every student achieve that goal. In the state of Florida, becoming a licensed state certified building contractor involves meeting the age, credit, and experience/education requirements before licensure will be granted. Have good moral character. (A criminal incident in the past does not prevent you from getting a license so long as you have had your civil rights restored, all debts to society paid, no pending or current liens such as IRS, and have no pending or ongoing criminal litigation). If you do not meet the 660 FICO score, you CAN still get your license by posting a licensing bond. This bond can be reduced by 50% upon completed a Financial Responsibility course. You do not have to have the necessary experience before you take the exam. The test scores are valid for 4 years meaning you have 4 years to gain the required experience after passing the state exam. Note: 3 years of any accredited college credits can be used in place of construction experience regardless of the subject matter/courses. For a free evaluation of your experience and guidance in this career field, please contact our Career Counselors at 1-800-732-9140. To register for the Classroom Based Building Contractor Exam Prep Program, use the “Schedule Your Course” box above, click on the “Register Now” button next to the course offering below, or call our helpful Career Counselors at 1-800-732-9140. Your Classroom Based Contractor Exam Prep Program will be divided into 3 parts, all of which are included in your tuition. Your tuition is valid for 1 year allowing you plenty of time to attend as many classes as you would like during this time frame. Classroom instruction one night a week (Offered in both English and espanol). Bring your questions and we will show you how to work through to the answer together. Your tuition is valid for 1 year. Enrolled students can repeat all parts of this program, including weekend exam reviews & 2-day workshops at no extra charge as often as necessary within the tuition period. Tuition does not include the state required reference books and tab sets. Contact a Career Counselor at 1-800-732-9140 for complete details & pricing. Start your course anytime! Classes are held weekly. Simply register for any of the locations below and you can begin immediately. Your tuition is valid for 1 year giving you access to unlimited classes and plenty of time to prepare for your license exam. The online contractor exam prep course is designed to enable you to prepare to pass the General, Building, or Residential Contractor exam with the convenience of online learning. Through interactive modules containing audio instruction, we bring the classroom experience into your computer or tablet allowing you to study at your own pace. This course combines the best of classroom education with the flexibility of self paced online learning. 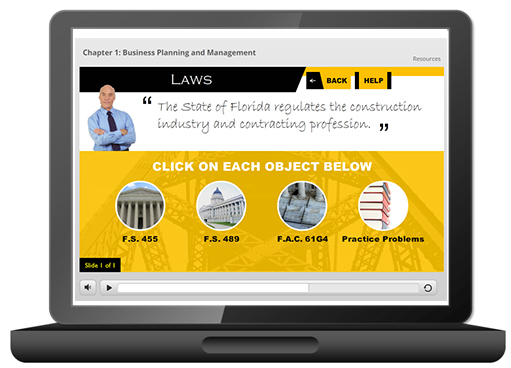 You will go through the material module-by-module gaining a mastery of how to navigate your state reference books, and enabling you to pass your state contractor exam with ease. Remember, the state licensing exam is an open book exam. The key to success is to develop the base knowledge, and combine that with familiarizing yourself with the various state exam books so that you can hone in on the answers quickly. This online course is designed to enable you to do just that. The course is loaded with hundreds of practice exam questions to help you evaluate your readiness and prepare you for success. These questions are constantly being updated based on student feedback on actual state exam topics. Tuition does not include the state required reference books and tab sets. Contact a Career Counselor for complete details & pricing. Take I-95 to Lantana Road. Exit west on Lantana Road to Congress Ave. Turn left on Congress and then left into Atlantis Plaza. (From the North) Take the turnpike to Lake Worth Road. Exit east on Lake Worth Road to Congress Ave. Turn right on Congress and then just past Lantana Road turn left into Atlantis Plaza. (From the South) Take the turnpike to Boynton Beach Blvd. Exit east on Boynton Beach Blvd to Congress. Turn left (north) on Congress. Turn into Atlantis Plaza, just south of Lantana Road. From I-95: Exit on Palmetto Park Road and go west. Make a RIGHT onto Military Trail and continue for less than 2 miles. The location is in the Fountain Square complex located immediately after Butts Road on the right hand side. From Turnpike: Exit on Glades Road and go EAST. Make a left on Butts Road. Follow the road around and make a left onto Military Trail. The location in the Fountain Square complex located on the right hand side. This Gold Coast building is located on the NE Corner of Hiatus Road and Commercial Blvd., approx. 1/8 mile East of the Sawgrass Expwy off of Commercial Blvd. Registration for all Insurance and Construction classes are handled by the Gold Coast Professional Schools office at the Broward campus. Located just minutes East of the Gold Glades Interchange (I-95, 826 and the Turnpike.) Exit on 163rd street and go East. Located in the Intracoastal Mall at N.E. 35th Ave.
Take the Florida Turnpike Extension south to NW 12th Street (exit # 27). Head east.Turn left on NW 111th Ave (just past the mall). Turn left on NW 20th Street. Building is on the left. Take the Florida Turnpike Extension north to NW 12th Street. Head east Turn left on NW 111th Ave (just past the mall). Turn left on NW 20th Street. Building is on the left. Head west on 836 to NW 107 Ave exit. Exit north on NW 107 Ave.Turn left on NW 12 St. Turn right on NW 111 Ave. Turn left on NW 20th St. Building is on left.